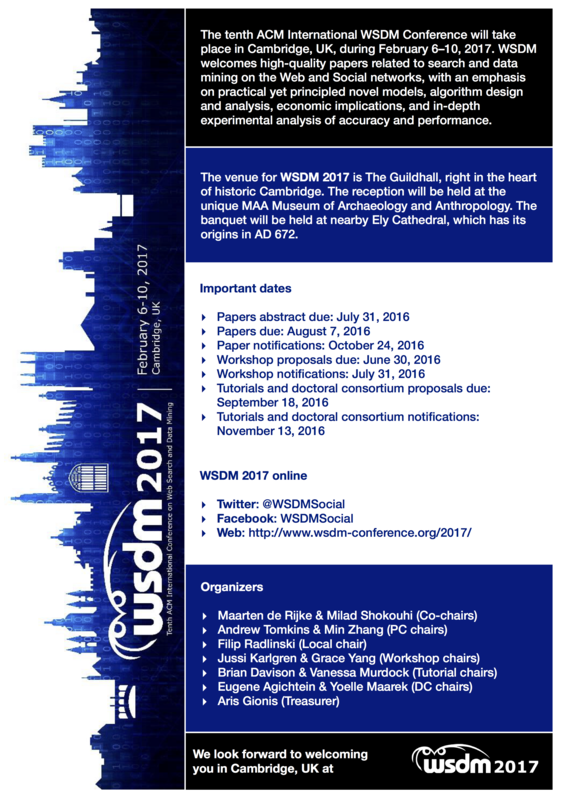 The important dates for WSDM 2017 (paper submission deadline, notification date) are fixed. Here’s a new flyer with the details. 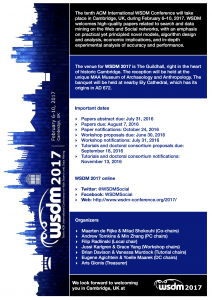 SIGIR 2016 will feature a workshop on Neural Information Retrieval. In recent years, deep neural networks have yielded significant performance improvements in application areas such as speech recognition and computer vision. They have also had an impact in natural language applications such as machine translation, image caption generation and conversational agents. Our focus with the Neu-IR workshop is on the applicability of deep neural networks to information retrieval. There are two complementary dimensions to this: one involves demonstrating performance improvements on public or private information retrieval datasets, the other concerns thinking about deep neural network architectures and what they tell us about information retrieval problems. Neu-IR (pronounced “new IR”) will be a highly interactive full day workshop that focuses on advances and challenges along both dimensions.